The chart shows that AMD's efforts in promoting the heterogeneous computing concept has not been wasted. The Radeon HD graphics cores implemented in the Trinity APUs really help improve their performance. As a result, A10 and A8 APU series are as fast as the Core i3 series, the general perspective differ from what we see in traditional applications without using graphics core resources. However, the junior dual-core APU Socket FM2 do not perform as well as their senior relatives. They are still much slower even than the Celeron G1620. We should remember that OpenCL does not make AMD's APU better than their opponents at every point. The GPU-based acceleration of computations can only be achieved in specific algorithms that allow decomposing the original task into a lot of identical subtasks. That’s why the majority of heterogeneous software is still concerned with image and video processing. The image editor GIMP is a good example of such applications. In the latest version, it features a library filters with enhanced support for OpenCL. Contrary to WinZIP, these filters are almost exclusively performed on the graphics core whereas the x86 cores only do some auxiliary work. Therefore, there is nothing to wonder that GIMP runs better on high-performance graphics hardware. To illustrate it, we can show you the speed of sequential execution of three resource-consuming effects: Gaussian blur, Motion blur and Bilateral. Enhancing performance based on GPU is what you can actually pay attention. Under favorable conditions, shader processor graphics core can guarantee a great performance boost. The graphics core structure of the AMD's Trinity APU is not only faster than Intel HD Graphics but also is also more optimized for computing. Hence, the application, such as GIMP, optimized OpenCL, AMD's APU can provide an outstanding performance when compared to their Intel peers. The Core i3-3225 with the most advanced version of Intel’s integrated graphics is only as fast as the junior Socket FM2 processor AMD A4-5300 when it comes to applying these image filters. The other Intel CPUs are much slower. Another example of an application that is compatible with OpenCL is the professional video editing tool Sony Vegas Pro 12. When editing, it can distribute the load between all the computing resources of the hybrid microprocessors. It should be noted that Intel's graphics core is not compatible with this application for some reason even though Ivy Bridge is specified to have no limitations in terms of its OpenCL support. Anyway, the owner of the LGA1155 systems can only rely on the traditional x86 computing resources this time. On the other hand, this fact did not prevent Intel to looks better in this test rendering in Sony Vegas compared to the previous case. The quad-core Trinity APU of AMD would be as fast as Intel's Core i3 in Sony Vegas Pro. The dual-core A6 and A4 series models compete successfully with the Pentium and Celeron CPUs. Next we test our processors in SVPMark 3. It is a specialized performance benchmark for the SmoothVideo Project software, which improved video playback by inserting an intermediate frame in the video stream. This software makes active use of GPU resources via OpenCL. Graph of APU load show that the x86 core do the bulk of work here. Socket FM2 A10 and A8 from AMD perform better than the Core i3. 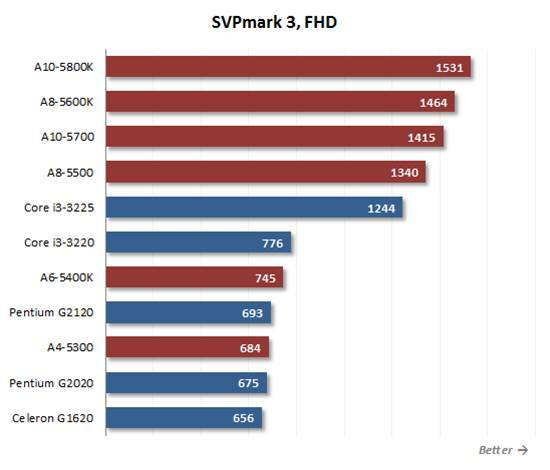 However, we still see Socket FM2 A10 and A8 from AMD perform better than Intel's Core i3. Judging by the difference between the Core i3-3225 and the Core i3-3220, the graphics core’s performance is important for this benchmark, so it is no wonder that the quad-core Trinity models are taking the lead. The dual-core A6 and A4 APUs look good, too. The results suggest that heterogeneous load is what the Socket FM2 platform needs to show its best. Intel's CPU, excepting perhaps the Core i3-3225, are not strong under such conditions. Therefore, if you plan to use video or image editing applications with OpenCL support, you may want to consider the performance of the graphics core when selecting the optimal platform. This factor affects the speed of your platform in such applications and is even more in 3D games. We should remember that the integrated graphics core can only be used for general-purpose computing without discrete graphics card in the system. If it is installed, integrated graphics disabled in the processor, so the whole APU concept only applies to integrated platforms. But when the system includes a discrete graphics core, the integrated GPU has no effect on 3D or heterogeneous computing performance, which means that the computing performance of x86 cores remains the main factor for choosing CPUs for classic discrete PC configurations.